CHEESEBURGUR? Copic marker on paper. I guess it's funny, but he looks a little woebegone to me. Well executed, though. 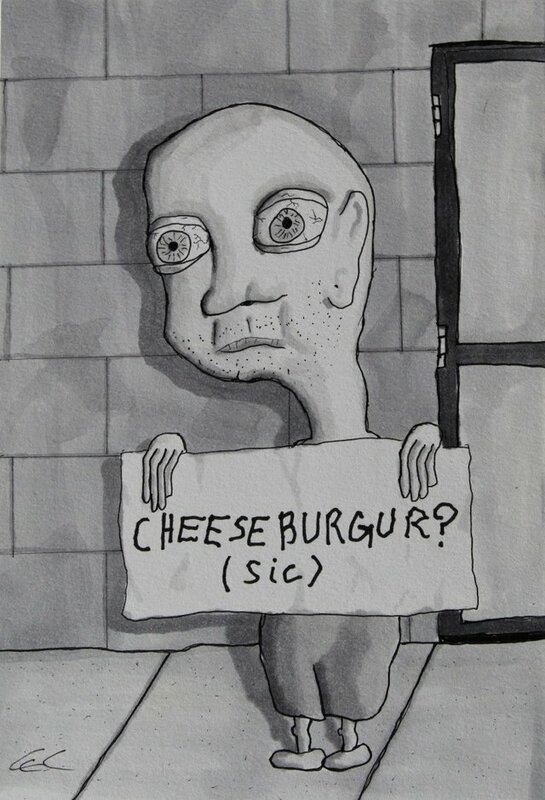 I have shown this piece publicly once before and when I did I listed the title as CHEESEBURGUR? [sic]: A self-portrait. I opted for a shorter title when sharing it this time. I actually drew this shortly after having my large intestine removed. I was on a very restrictive and very boring diet for quite a while, both before and after the surgery and was craving something different. I was definitely feeling a bit more 'woebegone' than 'funny' at the time that I created it. That is for sure.